Acting on a PIL filed by four infants seeking checks on air and sound pollution, the Supreme Court today prohibited bursting of sound emitting crackers between 10 pm and 6 am during any festival including Diwali but rejected their plea for a total ban on crackers. The court did not to impose any restrictions on use of colour/light emitting firecrackers. A bench of Chief Justice HL Dattu and Justice Arun Mishra said it was essentially only reiterating its 2005 order as they were not being strictly adhered to by the public and the authorities who are to enforce it. Rejecting the plea of Arjun Gopal, Aarav Bhandari and Zoya Rao Bhasin, all aged between six months and 14 months, for complete ban on crackers or designated areas/ open grounds for bursting crackers, a bench headed by Chief Justice H L Dattu told Abhishek Manu Singhvi, the senior lawyer who appeared for them: “If a citizen wants to burst crackers outside his home, it is his right. We cannot ask him to go to a particular maidan or secluded place. No it is not possible”. The court also said every manufacturer shall on the box of each firecracker mention details of its chemical contents and that it satisfies the requirement as laid down by Department of Explosives or else the manufacturer may be held liable. 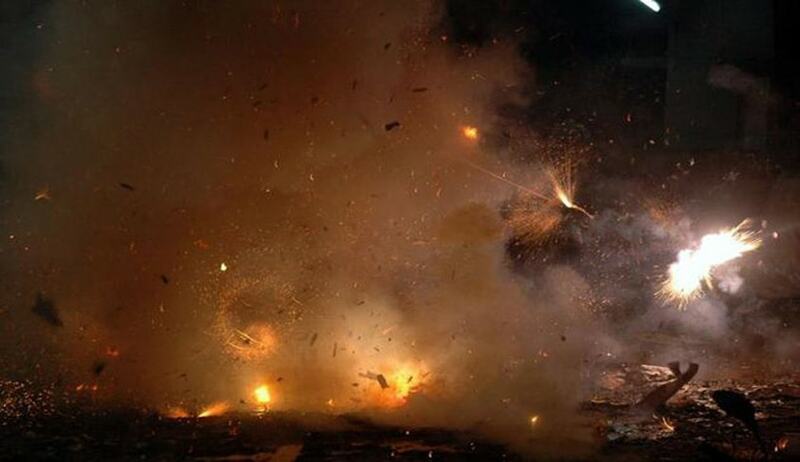 SC ordered the centre and state governments to give wide publicity through the print and electronic media from October 31 about the ill effects of fire crackers. It also asked the teaching community to actively and vigorously spread awareness about the ill effects of fire crackers among students. The toddlers had sought urged for urgent measures to bring down the "fatal" pollution level in Delhi. Filed with the help of advocate Pooja Dhar, the petition demanded, among other things, total ban on the use of firecrackers, sparklers and explosives during festivals. They have also sought an interim stay before the ensuing Diwali. "Over the last 2 years, Delhi has retained unique distinction of being most polluted city in the world. Levels of Particulate Matter are highest and across the country, over 7,00,000 deaths occur annually due to air pollution-related diseases. Studies show citizens of India have 30 per cent lower lung capacity than Europeans and that the children are worst affected, as their lungs are not fully developed, making their systems more vulnerable," it said. The infants said while considerable debate and long-term measures are being discussed by "slow moving state machinery for implementation of measures to control pollution levels in Delhi", the highest court of the land was "duty bound" to take interim steps in effectuating the people's right to clean, healthy and breathable air under Article 21 of the Constitution. "We are the most vulnerable category when it comes to air pollution, especially from suspended particles and toxins. We are foremost prone to lung disease, asthma, coughing, bronchitis, retarded development of the nervous system and cognitive impairment:" said the infants in their petition. The PIL quoted a May 2014 report of the WHO which said Delhi was the most polluted city in the world. It said the Ambient Air Pollution (AAP) database contains results of outdoor air pollution monitoring from almost 1,600 cities in 91 countries. The national Capital has the highest concentration of PM 2.5 - particulate matters less than 2.5 microns - form of air pollution, which is considered most serious and can cause respiratory diseases and other health problems.